There were tales of tortillas made from impeccably sourced single-origin corn. Rohan duck was cured for three days. And a Michelin chef from Mexico City was going to change the way New Yorkers thought about his cuisine. Could any place meet the expectations generated by such hype? The raves about Batard and Upland had been warranted. 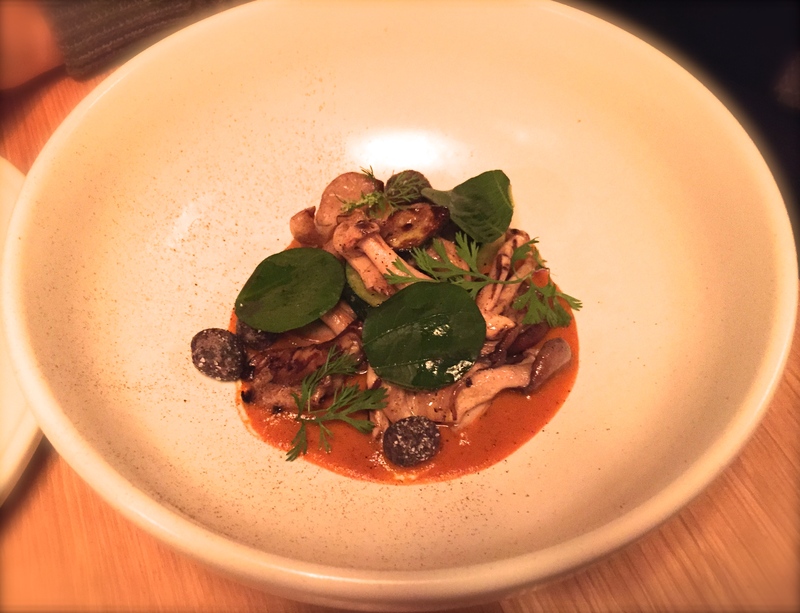 So I was hopeful that the glowing reviews for Cosme, Enrique Olvera’s new Flatiron restaurant, would lead me to the trifecta of great new places to dine in NYC this winter. But this horse didn’t cross the finish line. Maybe the critics – all now easily recognized – were given the royal treatment. But even they had some minor gripes about service – readily dismissed because of the excellent food and supposedly great cocktails. I have to wonder if they dined with me, would it change my impression of the meal or theirs. But regardless, whoever does the PR for this place deserves an award. Few manage to incorporate uni in a dish that highlights its flavor and texture. Marea does a good job; Elan not so much. I was curious to see how it was treated here, so we started with the uni tostada. 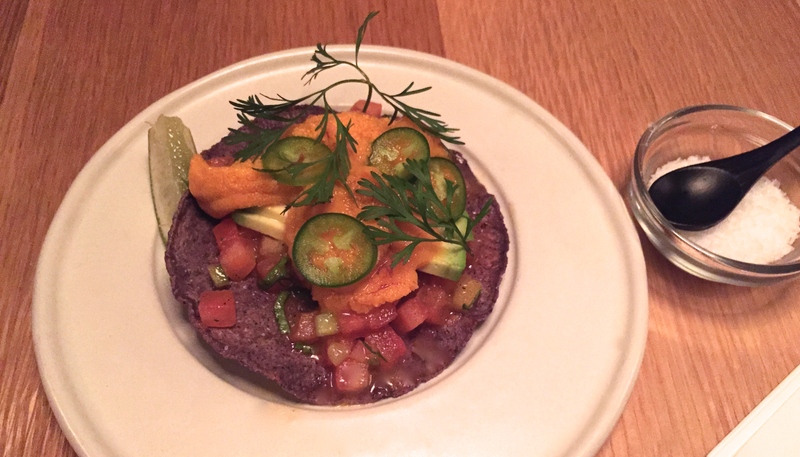 3-4 pieces of uni, a few slivers of avocado, jalapeno and bone marrow salsa on one tostada – for $18. The silkiness of the uni is, of course, lost in the mix. I didn’t taste or see any bone marrow either. Not a dish to share, and not a dish to order again. Next was the mushroom and squash barbacoa – another one of THE items to try. Having read about how it take days to prep the carnitas, it was a must, and nothing else seemed particularly interesting on the limited menu. In fact, almost every table ordered this. 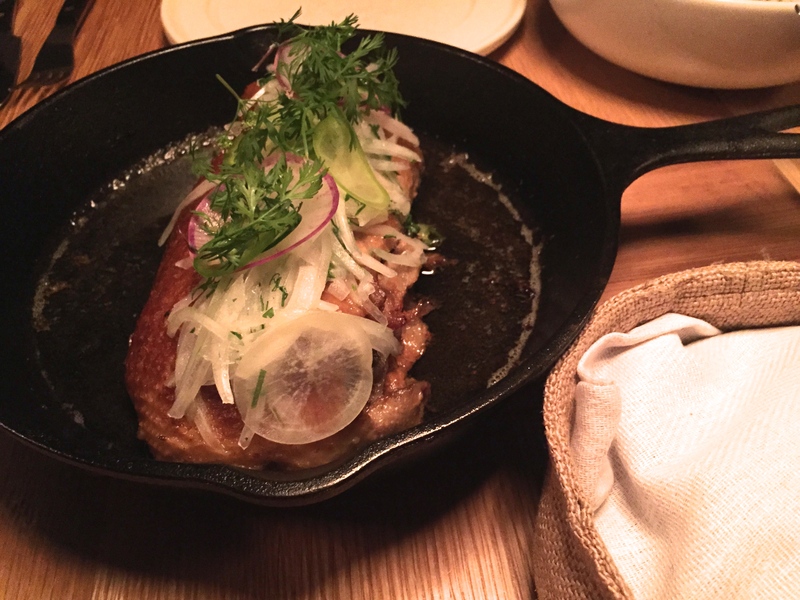 And it’s a good thing, because I cannot say there is any other reason to go to Cosme, except for this dish. The portion is large enough for three. The meat is well-seasoned, and there’s no un-rendered fat under the crispy skin. Definitely order this if you come here, At $59, the dish is expensive but not over-priced, especially considering the prep time and comparing it to the other main course prices on the menu. We had leftovers too. But they only packed the duck. 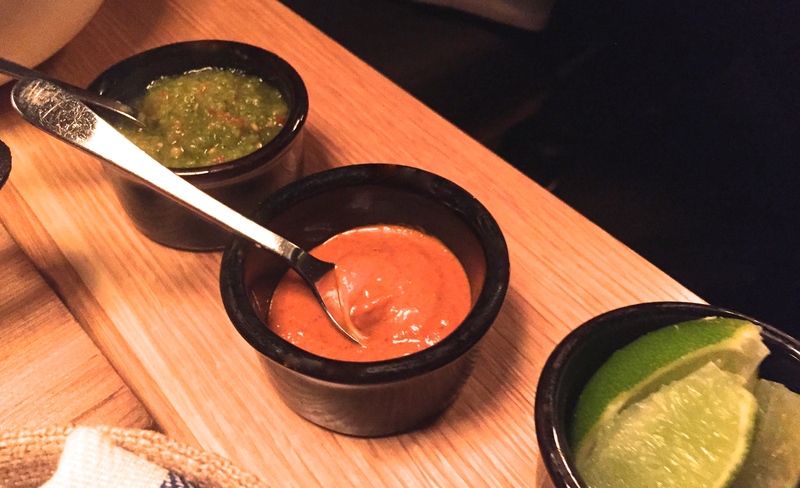 Why would anyone not want to take home the salsa verde and other unidentified sauce (tried to find the name to no avail) and especially the tortillas that accompany it? None of this was in my to go bag. What a shame, particularly since it’s meant to be eaten as a taco. 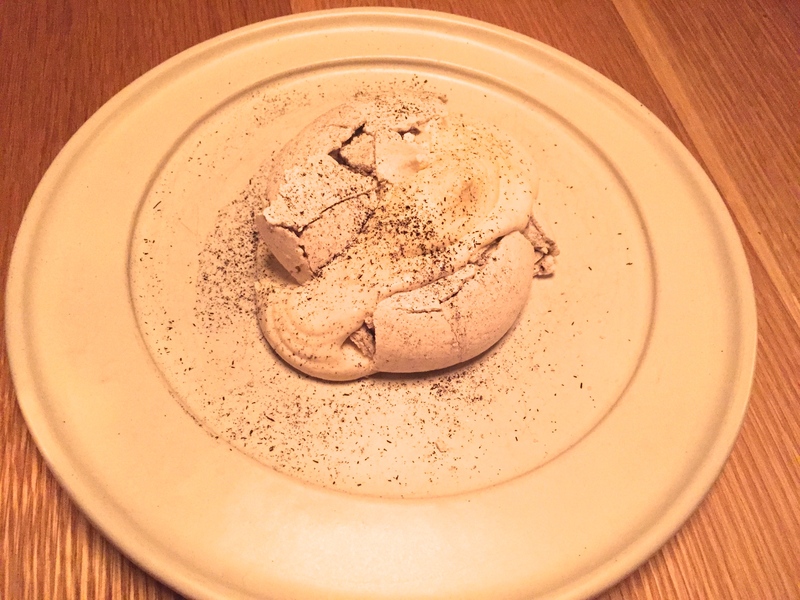 For dessert, we tried the husk meringue and corn mousse. The meringue was perfect. This was a highlight of the evening, and I’m not a huge fan of ending the meal where my last bite doesn’t contain either cheese or chocolate. The wine list was nothing special and hugely marked up. So we tried the house cocktails ($14), which were tasty, but with about two sips in a large glass with 3 ice cubes. If your liquid does not even come halfway up the ice, there’s a problem. When ordering off menu, they had the nerve to charge even more! $16 for a gimlet in a tiny glass. As for the supposed mezcal flight, no one mentioned it to us. No one seemed to really care about anything we ordered. The room was a dark grey, and most tables would require a flashlight to see the menu. The ones with light are all two-tops (where we sat). Don’t expect any privacy though. We were privy to the conversation of a local, former Top Chef contestant sitting on one side of us trying in vain to have a romantic meal. On the other a vapid socialite, obviously there to tell her friends, ordered almost everything on the menu, even though she proclaimed she didn’t like most of the ingredients in the dishes. Then the same table (on a recommendation from the table next to them) proceeded to order not one – but TWO sides of shisito peppers mid-meal. When you can’t escape the diners around you as part of your experience, it’s a problem, especially when it leads to eye rolling. Sub-par service did not make up for the lack of ambiance. Drinks took too long to arrive when it was not packed by any means. And we felt rushed, with the mid-course served at the same time as the duck. And half the runners cannot be understood when describing the dishes. No one checked on us – or anyone else it seemed. Plus, do NOT pick up my credit card slip while I’m still at the table. It is beyond rude. When you charge a lot for the food and drinks, then you should have good service at a minimum. It’s a complaint that has echoed from others I know that have tried Cosme. So I will say this – go once. Get the duck and meringue. Then you will have tried it, and can be equally as happy at a hole-in-the-wall Mexican restaurant with a lengue taco for $4. Once the hype dies down, I’m curious to see how many will go back for a second visit. I certainly won’t.